If your daughter has wanted to try out Guiding (in Ontario) but you were afraid to make a commitment without knowing how you and your daughter would like it, here’s your chance. 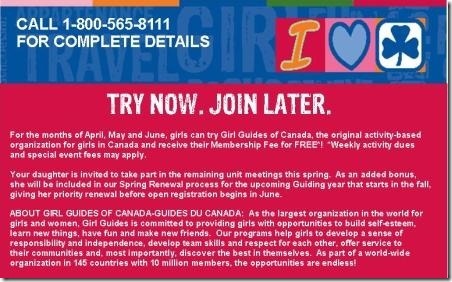 For the months of April, May and June, girls can try Girl Guides of Canada, the original activity-based organization for girls in Canada and receive their Membership for FREE*! *Weekly activity dues and special event fees may apply. Your daughter is invited to take part in the remaining unit meetings this Spring. As an added bonus, she will be included in our Spring Renewal process for the upcoming Guiding year that starts in the fall, giving her priority renewal before open registration begins in June. ABOUT GIRL GUIDES OF CANADA-GUIDES DU CANADA: As the largest organization in the world for girls and women, Girl Guides is committed to providing girls with opportunities to build self-esteem, learn new things, have fun and make new friends. Our programs help girls to develop a sense of responsibility and independence, develop team skills and respect for each other, offer service to their communities and most importantly, discover the best in themselves. As part of a world-wide organization in 145 countries with 10 million members, the opportunities are endless! While you will still have to pay dues (usually around $1 a week) and any fees for extra activities you choose to send your daughter to, the registration fee will be waived. Your daughter will get a chance to check out the branch of Guiding that she would fit under and see what it’s all about. There are units all over Canada but only Ontario is participating in Try Now Join Later. Call the 1-800-565-8111 number to find your local unit and find out more. What Branch Is My Child Under? You can find out more about Girl Guides of Canada-Guides du Canada on the official website. You might also want to check out the Girl Guides CAN Blog, GGC on Facebook, Twitter and Pinterest. If It Isn’t Fun.. It Isn’t Guiding!